Originally designed for our school apparel collection, our Scooter Skirt “Skort” is a sporty new skirt with the secret shorts. It is the most comfortable garment in our uniform apparel collection! Made with a light poly-stretch blend fabric for full mobility—this piece is a playful addition to any semi-casual uniform program. The Scooter Skort is available in Navy and Khaki. Set up your distributor account and start selling the Scooter Skort today! 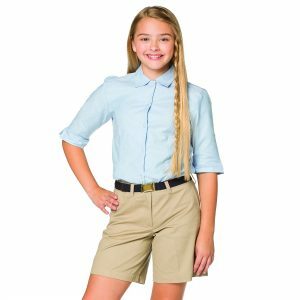 SKU: 2332- Scooter Skirt "Skort"
Tags: Casual Skirt, Juniors Skort, Khaki Skort, Navy Skort, School Skort, Scooter, Secret Shorts, skirt, Skirt with Shorts, Skort.